Much of western and central Scotland has been warned to expect hazardous conditions due to ice on Tuesday. A UK weather warning covers much of Central Scotland, including Glasgow, Dumfries and Galloway, Perth and Stirling. Clear skies mean the temperature plummeted in the north over the weekend. The warning has been reissued by the Met Office and remains in effect until 10am tomorrow. A yellow alert means there’s a danger of falls due to icy roads, pavements and cycle paths. A statement from the Met Office said: “Showers will turn more frequent across western Scotland from midnight. “With light winds, this will allow icy patches to form in some places, leading to some hazardous road conditions overnight and on Tuesday morning, including during the morning rush hour. “Over hills and mountains showers are expected to be wintry. The temperature is expected to plummet as low as -4C overnight. Alex Burkill of the Met Office said this sudden freeze could catch out gritting crews, who may have little time to treat roads before the morning rush hour. He said:”If they spread salt too early, it will be washed away by the evening showers. “But when the skies clear around 3am, it does not leave crews with much time before the traffic picks up. 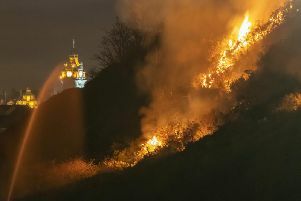 Other affected areas include the Highlands, Argyll and Bute, East Renfrewshire, Inverclyde and North and South Ayrshire.